H&M Divided Line has released its latest lookbook which features quite lovely looks. This time you won’t spot any bohemian styles which seems to be a signature of the brand. Or else, the collection is far from being romantic and exquisite. Quite the contrary, all the clothing pieces presented here are rather casual and even sporty. However, this is exactly what makes the looks so special, isn’t it? For instance, if you are finally determined to give up on long and cosy evenings with a cup of hot chocolate and a bowl of cookies in favor of jogging, what else if not outfits from this new lookbook will you wear? New life starts in the closet, so take a look at the images below and choose your perfect ensemble for the daily work-outs. 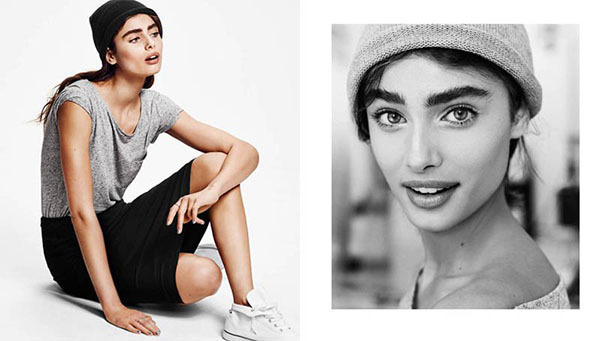 The Swedish giant tapped Taylor Hill to star in the engaging photoshoot. The American model looks adorable as she poses agaisnt a very simple background. After all it is not so much about the photoshoot setting but about the stylish clothing pieces by H&M Divided Line. The brunette stunner is captured by Hasse Nielsen – a very talented photographer from Camera Link. All the images are full of very saucy and lively zest, which makes one fall in love with the enchanting beauty of the model as well as the perfect designs by H&M. What you see in the catalogue will by all means speak to you a lot. The trendy and very plain silhouettes are mixed in solid looks, while the color palette stays quite moderate. You are not likely to spot anything that would go beyond black, white, or gray – yet, this adds a specific touch to the collection. Browse through the gallery to see more of H&M Loungewear 2014.